Using a coring tool is an easy way to limit excessive dust and debris from falling on the floor when taking asbestos samples from a wall. However, there is another way to take a sample with out spilling drywall or plaster dust on the floor. 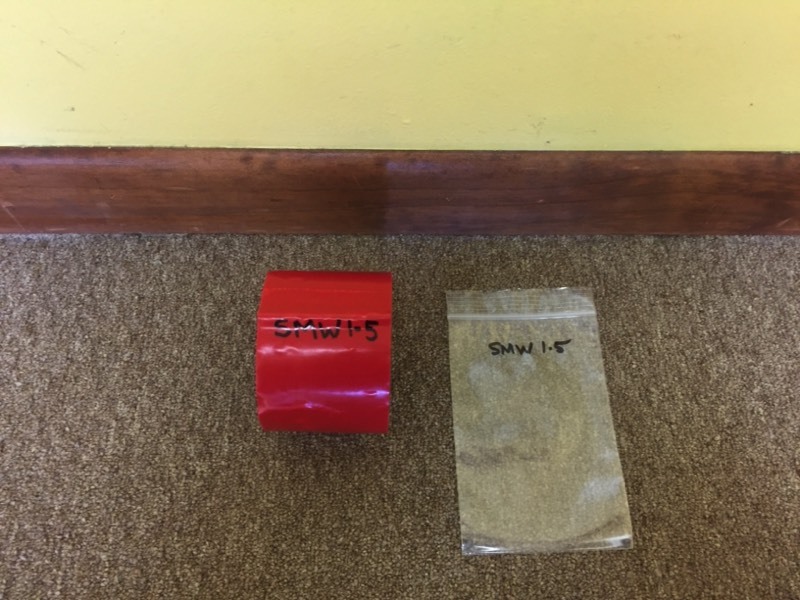 All that is needed is a sample bag, utility knife, and a role of tape (red abatement tape is best!). 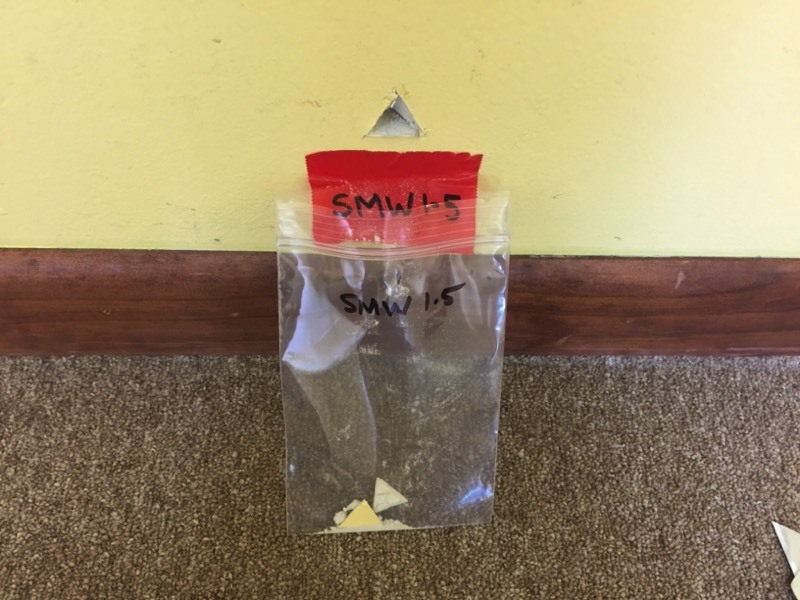 Open your sample bag and simply tape the edge of one side of the bag to the wall directly below your intended sampling cut. 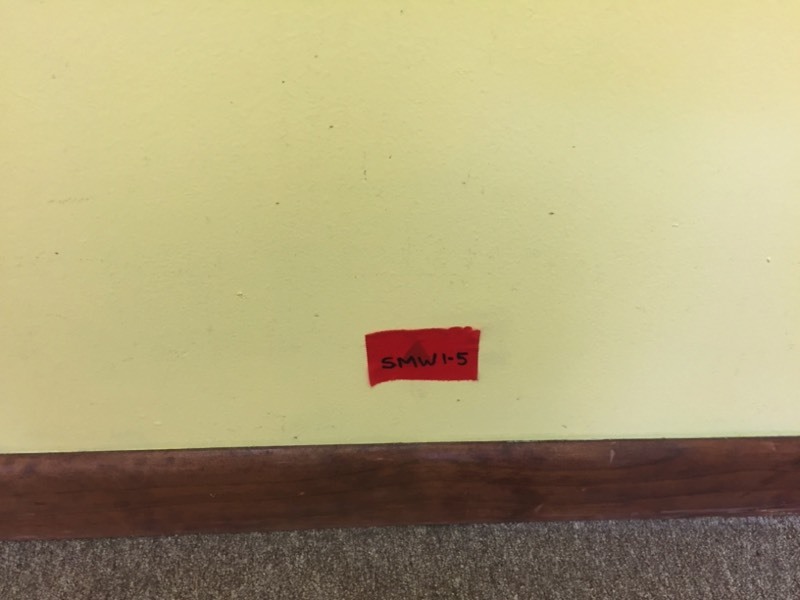 Cut your sample out of the wall (its easier to pull a triangle cut out of the wall then a square one) and allow for the debris to slide down your tape and directly into your bag. 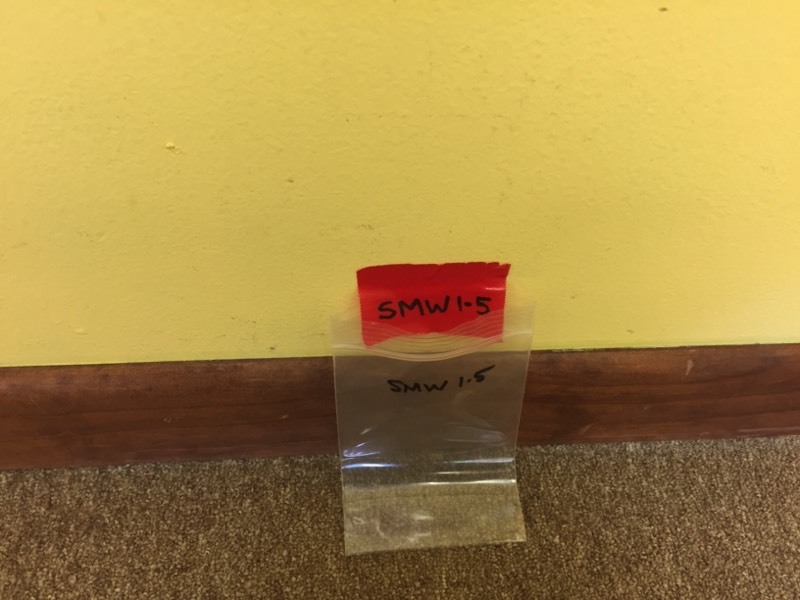 Next, wet wipe any dust off the tape and then simply place the tape (with sampling identification number) over your sampling cavity to cover. Anyone can take asbestos samples to a laboratory for analysis. However, your asbestos report will only be accepted by a contractor or permitting office if the inspection was performed by a state certified asbestos inspector. Hiring a state certified asbestos inspector will ensure that samples and documentation will be done according to all applicable state and federal regulations. If you do not require a state certified report and are seeking a laboratory to have samples tested yourself, there are several excellent laboratories around town such as Reservoirs Environmental, EMSL Analytical or Aerobiology Laboratories. It is a good idea to get an asbestos inspection prior to purchasing a home if allowed by the seller. An inspection can alert the buyer to potential hazards in the home and can help the buyer avoid expensive asbestos related accidents or mistakes during future remodeling and demolition activities associated with the property. Sellers will often not allow complete inspections of the properties due to the destructive nature of sampling (removing a series of 1”-2” samples from walls, ceilings, floors, etc. throughout the home). Sellers will usually allow limited inspections and samplings such as popcorn ceilings, attic insulation, floor tile, ductwork wrappings and other inspections that are less damaging to the property as a whole. Have a conversation with the seller about any previous asbestos inspections or past remodeling histories. Knowing as much about your home’s history as possible can help you save thousands of dollars on your investment. Removing popcorn ceiling texture seems to be one of the first projects new home buyers want to take on after purchasing their new home these days. There is plenty of information out on the web (from YoutTube to Pinterest) on how to remove popcorn textures but little information about the asbestos associated with it. 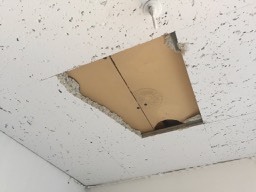 Asbestos was used prevalently in popcorn ceiling texturing in homes built before the 1980s and is found often during inspections. Because popcorn texturing is highly friable (can be turned to dust via hand pressure), it is very important to obtain an asbestos inspection before working with this material. A minimum of three or more samples will be taken to properly inspect the ceiling textures for asbestos. Sample areas will generally be misted with a spray bottle to minimize dust. Samples can than be scraped directly into a sealable polyethylene bag and sent to a laboratory for sampling. Asbestos containing popcorn texturing should be removed by a state certified asbestos abatement contractor according to all state and federal regulations. We often get calls from home owners after they speak with flooring contractors such as Home Depot and others. Removal of any flooring material (including 9" floor tiles, linoleum, sheet vinyl and more) over 32 square feet in a single family residence requires an asbestos inspection. New homes built after the 2000s need to be tested as well. Asbestos has been banned for a long time, but we do import products from other countries. Although it is unlikely to find asbestos in new homes, it is a possibility and occasionally happens from time to time. 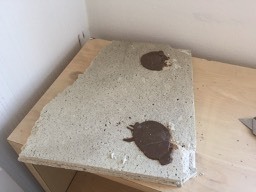 When sampling, it is important to test the glue or mastic below the flooring material and to look for hidden layers as well. It is not uncommon to find multiple layers of flooring material in any given area. 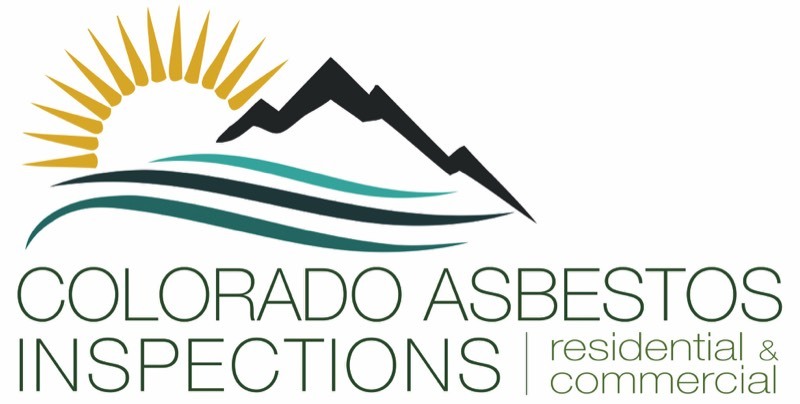 Colorado Asbestos Inspections can provide home owners and contractors results and full reports within two to three business days from the time of inspection.